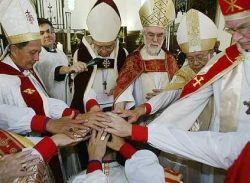 To higher office: Dr Chew (fourth from right), Dr Williams (third from right) and other bishops blessing Ng (below left) in Kuala Lumpur yesterday as he was elevated to bishop level. KUALA LUMPUR: A new bishop was consecrated in a service attended by nearly a thousand people at the St Marys Cathedral here yesterday. Canon Ng Moon Hing, 52, was blessed and installed as the fourth Bishop of the Anglican Diocese of West Malaysia at a service which was also attended by the Archbishop of South-East Asia, Dr John Chew, and the Archbishop of Canterbury, Dr Rowan Williams. The main consecrator was Dr Chew, who performed the blessing. When asked about his elevation, the media-shy Ng just smiled. Ng, the vicar of St Peters Church in Ipoh, succeeds Tan Sri Dr Lim Cheng Ean, who recently retired as Bishop of West Malaysia.